NEW YORK (CNNMoney.com) -- Balancing state budgets these days is tough enough. But more than a dozen governors have promised to do it without raising taxes. These state chiefs, nine of whom were elected two weeks ago, will have little choice but to slash spending in order to bring their budgets in line, experts say. All of them are Republican, save for New York's Gov.-elect Andrew Cuomo. While left-leaning advocates fear that the vulnerable will lose their safety nets, their GOP counterparts see the Republican landslide as an opportunity to overhaul state services. "We'll see sincere dialogue on the role and function of state government and what its priorities should be," said Patrick Gleason, director of state affairs for the Americans for Tax Reform. Governors will "have to make some tough cuts." Not surprisingly, most winning candidates were long on promises but short on specifics. Many said they would rightsize state governments, but didn't explain how they'd do it. And even if they've dispatched the Democrats standing in their way, they still have to deal with powerful public employee unions. Some bargaining groups are agreeing to concessions over salary and benefits. But others are not, which governors say force them to make layoffs and deeper budget cuts. The tug-of-war between raising taxes or cutting spending has been waged for the past three years, as the Great Recession decimated tax revenues. Since Democrats had control over 16 governor's mansions and statehouses in 2010, they favored raising taxes to spare devastating cuts to state programs. States have increased taxes by more than $32 billion over the past two years, said Todd Haggerty, policy associate at the National Conference of State Legislatures. But Tuesday's election led to a stunning reversal of control. Republicans will now run 20 states, up from only nine. The GOP also captured more than 675 seats in state legislatures. These newly elected officials, along with the incumbents, are staring at budget gaps totaling least $72 billion for fiscal 2012, which starts in July in most states, according to the state legislatures group. Not only do tax revenues have yet to recover, but states must contend with the end of federal stimulus assistance for Medicaid, certain education expenses and other safety net programs. 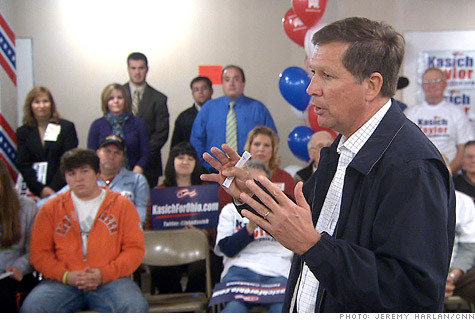 Ohio Gov.-elect John Kasich pledged during his campaign that he would reduce taxes. His answer to solving the budget problem is to make the state more business-friendly, which will result in greater revenues. Kasich also wants to reduce the size of the state government by reforming programs and shedding those that don't work, said his press secretary, Rob Nichols. Though he didn't provide many specifics, Nichols said everything would be examined. The governor-elect said the election gave him a mandate to overhaul state services. He will have to tackle a budget gap is estimated to be between $4 billion and $10 billion. "We took a step forward to shrinking government and making it better," Kasich said in his acceptance speech. "Ohio has said it wants to run our state in a new way." In Pennsylvania, Gov-elect Tom Corbett has called for reducing state administrative operations by 10% and for cutting the state automotive fleet by 20%, which would save $140 million over 10 years. He also wants to eliminate per diems given to certain state workers and require all elected officials to contribute to their health care coverage. 0:00 /5:26Texas governor fed up with D.C.
Republicans now control the governor's mansion and both houses, ousting Democrats who ran all three. They will have their work cut out for them since they are facing a budget gap of at least $2.4 billion and Corbett has promised not to raise taxes. "We have the opportunity to bring fiscal discipline to Pennsylvania, to bring limited government and to bring free enterprise to Pennsylvania," Corbett said in his acceptance speech. Republicans, however, aren't the only ones calling for a freeze in tax hikes. New York Gov.-elect Andrew Cuomo has also pledged not to raise corporate or personal taxes or sales taxes, even though the state is facing a $10 billion deficit. He also wants to put a ceiling on local property tax increases. To get the Empire State's fiscal house in order, Cuomo said he would freeze salary increases for state employees and impose a cap on state spending. He would also reduce the number of state agencies, commissions and authorities by at least 20% through consolidation or elimination. He also wants to take over the administration of Medicaid from the counties, in hopes of better controlling participants' use of the program. And Cuomo wants to reduce ever-escalating pension costs by providing less generous benefits to new hires. The governor-elect also wants to boost job growth by providing a $3,000 tax break for companies who hire the unemployed and by reducing the cost of doing business in the state. "We can't raise taxes because we will never attract jobs if New York is the tax capital of the nation," he said in a video address last week.